The eighth judge to serve on the Commonwealth Court was Theodore O. Rogers who was appointed to serve on the Court in January 1971 by Governor Shafer upon Judge Barbieri’s appointment to the Pennsylvania Supreme Court. A graduate of the University of Pennsylvania and the University of Pennsylvania Law School and a resident of Chester County, Judge Rogers served on the Court until 1986. 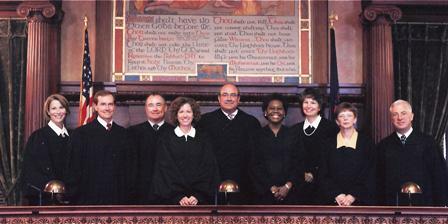 The ninth judge to serve on the Commonwealth Court was Genevieve Blatt, a graduate of the University of Pittsburgh and the University of Pittsburgh Law School. 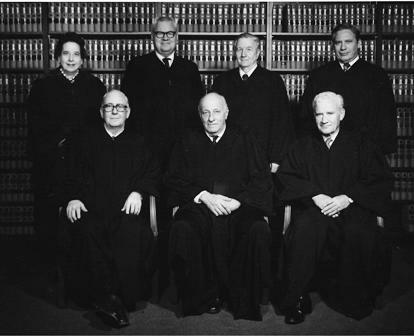 She was appointed by Governor Milton Shapp in 1972 to replace Judge Manderino upon his election to the Supreme Court. A native of Clarion County but a long-term resident of Dauphin County, she had been active in politics for decades and had been elected Secretary of Internal Affairs in 1954 and reelected in 1958 and 1962. She was the first woman to serve on the Court and she served as a judge from 1972 to 1983 and as a senior judge from 1983 to 1993. The tenth judge to serve on the Commonwealth Court was Richard DiSalle, a graduate of the University of Pittsburgh and the University of Pittsburgh Law School. He was appointed to the Court in 1977 by Governor Shapp to replace Judge Kramer who died in 1977. A former Washington County Common Pleas Court Judge, he served on the Court until 1980. He lost the election in 1979. He later served on the Pennsylvania Superior Court. 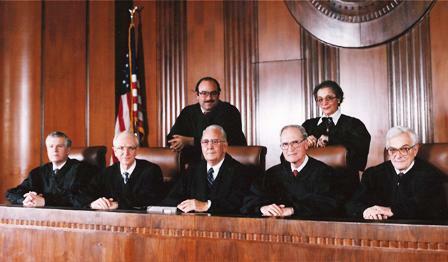 In 1978 the Commonwealth Court was expanded from seven to nine members and Governor Shapp appointed two new judges. David W. Craig assumed office in July 1978. A graduate of the University of Pittsburgh and its law school, he was a former city solicitor for Pittsburgh. In 1990, he became the Court’s third president judge and he served in that position until his retirement in 1994. John A. MacPhail assumed office in July 1978. A graduate of Washington and Jefferson College and Dickinson School of Law, he was a former judge on the Adams County Court of Common Pleas. Judge MacPhail served on the Court until his retirement in 1988. The 13th judge to serve on the Court was Robert W. Williams, Jr. of Philadelphia. A graduate of Howard University and Boston University School of Law, he was elected in 1979 and was the first African American to serve on the Court. He resigned in 1985 to pursue elective office in Philadelphia. 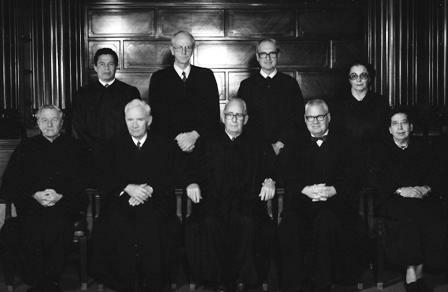 The 14th judge to serve on the Court was Madaline Palladino who was appointed by Governor Thornburgh after the death of President Judge Bowman in 1980. A graduate of the University of Pennsylvania and of Columbia University School of Law, Judge Palladino served on the Court as an appointed judge from October 1980 to January 1982. She returned to the Court in January 1984 after winning election in 1983. She served on the Court until her retirement in 1994. The 15th judge to serve on the Court was Joseph T. Doyle, a graduate of LaSalle University and Villanova Law School. A former member of the Pennsylvania House of Representatives from Delaware County, he was elected in 1981 and served on the Court until his retirement in 2002. He served as the Court’s fifth president judge from 1999 to 2002. 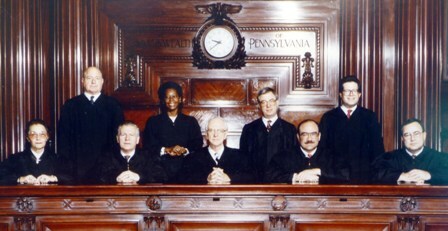 Three judges were elected to the Court in 1983 to fill the vacancies of Judge Wilkinson (who became a Pennsylvania Supreme Court Justice in 1981), of Judge Mencer (who became a Federal Judge in 1982) and of Judge Blatt (who became a Senior Judge in 1983). Madaline Palladino, who had previously served as an appointed judge, was one of the three elected judges in 1983. The 16th judge to serve on the Court was Francis A. Barry, a graduate of Duquesne University and the Duquesne University School of Law. He joined the Court in July 1983 having been appointed by Governor Thornburgh after winning the nominations of both major political parties in the spring of 1983. He was a commissioned judge until 1990 when he became a senior judge. The 17th judge to serve on the Court was James Gardner Colins, a graduate of the University of Pennsylvania and Villanova Law School. A former municipal court judge in Philadelphia, he joined the Court in 1984 and served until his retirement in 2008. He served two terms as president judge: The first from 1994 to 1999 and the second from 2002 to 2007. After retiring in 2008, he returned as a senior judge in 2012. Two judicial positions were on the ballot in 1987 because Judge Rogers reached retirement age in 1986 and Judge Williams resigned in 1985 to run for District Attorney in Philadelphia. The 18th judge to serve on the Court was Bernard L. McGinley who was elected in 1987 and retained in 1997 and 2007. A graduate of John Carroll University in 1967 and the University of Pittsburgh Law School in 1970, Judge McGinley retired in 2016 after 28 years on the Commonwealth Court and 6 years on the Allegheny County Court of Common Pleas. The 19th judge to serve on the Court is Doris A. Smith-Ribner who was elected in 1987 and retained in 1997 and 2007. She is a graduate of the University of Pittsburgh and the University of Pittsburgh School of Law. She is a resident of Philadelphia and retired on July 31, 2009. Judge MacPhail chose not to run for retention and the 20th judge to serve on the Court was Dan Pellegrini who was elected in 1989 and retained in 1999 and in 2009. He was elected President Judge in 2012. A graduate of Duquense University in 1967 and Duquesne University Law School in 1970 and the City of Pittsburgh solicitor from 1982 to 1990, he was President Judge of the Commonwealth Court from 2012 to 2015. He retired at the end of 2015 after 26 years of service on the court. Judge Barry reached retirement age in 1990 as did President Judge Crumlish. 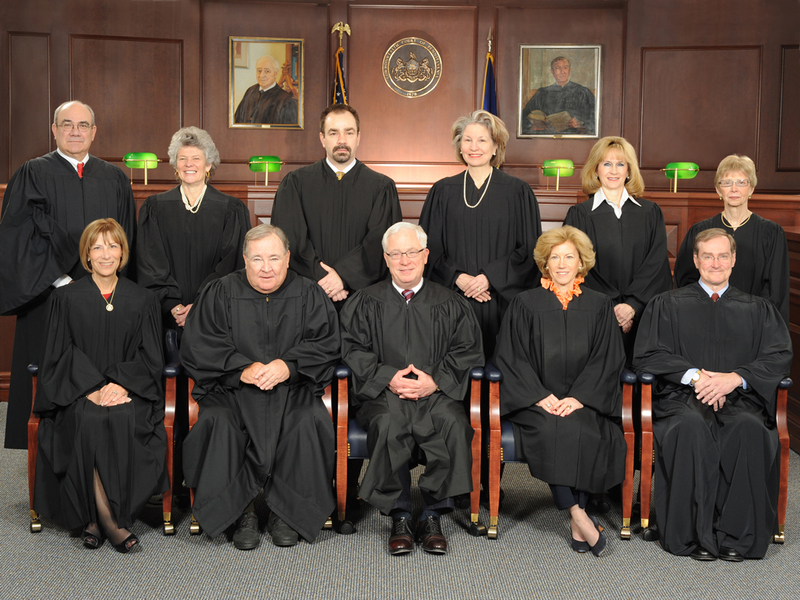 The 21st judge to serve on the Court was James R. Kelley who was appointed by Governor Robert Casey in 1990, was elected in 1991 and served as a senior judge from 2002 to 2012. He is a graduate of St. Vincent College and the Columbus School of Law, Catholic University of America, and a lifelong resident of Westmoreland County. The 22nd judge to serve on the Court was Robert L. Byer who was appointed by Governor Robert Casey in 1990 but was not elected in 1991. He is a graduate of the University of Pittsburgh and the University of Pittsburgh Law School. The 23rd judge to serve on the Court is Rochelle S. Friedman who was elected in 1991, retained in 2001 and became a senior judge in 2009. See current senior judges. Judge Palladino retired in 1993 and the 24th judge to serve on the Court was Sandra Schultz Newman who was elected in 1993. A graduate of Drexel University, Temple University and Villanova School of Law, she successfully ran for the Pennsylvania Supreme Court in 1995. She retired from the Supreme Court in 2006. President Judge Craig retired in 1994 and the 25th judge to serve on the Court was Jim Flaherty who was elected in 1995 and was a senior judge from 2000 to 2010. He is a graduate of Washington and Jefferson College and the University of Pittsburgh School of Law. In light of Judge Newman’s election to the Pennsylvania Supreme Court in 1995, the 26th judge to serve on the Court is Bonnie Brigance Leadbetter who was appointed by Governor Tom Ridge in 1996, was elected in 1997 and retained in 2007. She is a graduate of Rice University and the University of Pittsburgh Law School. She was the sixth President Judge of the Commonwealth Court serving from 2007 to 2011 and she retired from the court in 2016. The idea for the creation of the Commonwealth Court Historical Society was first advocated and actively supported by President Judge Leadbetter in 2007. 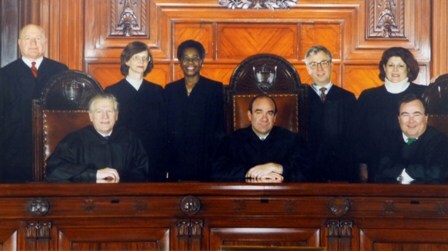 Judge Flaherty reached retirement age in 2000 and President Judge Doyle and Judge Kelley reached retirement age in 2001; as a result three positions were on the ballot in 2001. The 27th judge to serve on the Court is Renée Cohn Jubelirer who was elected in 2001 and retained in 2011. See current judges. The 28th judge to serve on the Court is Robert (Robin) Simpson who was elected in 2001 and retained in 2011. See current judges. The 29th judge to serve on the Court is Mary Hannah Leavitt who was elected in 2001 and retained in 2011. She was elected President Judge in 2016, the 8th President Judge of the Commonwealth Court. See current judges. Judge Colins (former President Judge) resigned in 2008 and the 30th judge to serve on the Court is Johnny J. Butler who was appointed by Governor Edward Rendell and joined the Court in July 2008 and was appointed to the Court again in 2009 in light of Judge Smith-Ribner's retirement in 2009. He served on the Court unil 2012. He is a graduate of Howard University and Howard University School of Law with a Master's Degree in Law from Columbia University. In light of Judge Colins’ resignation and in light of Judge Friedman’s reaching retirement age in 2008, two positions were on the ballot in 2009. Victorious in the November 2009 election were Kevin Brobson and Patricia McCullough. The 31st judge to serve on the Court is Kevin Brobson. See current judges. The 32nd judge to serve on the Court is Patricia McCullough. See current judges. In the election of 2011, Anne Covey was elected as the 33rd judge to serve on the Court. See current judges. The 34th judge to serve on the Court is Michael H. Wojcik who was elected in 2015 in light of President Judge Pelligrini turning 70 in 2015. See current judges. The 36th judge to serve on the Court is Joseph Cosgrave who was appointed by the Governor and confirmed by the Senate in June 2016, replacing retiring Judge Leadbetter. He was not successful in the primary election in the spring of 2017. The 37th judge to serve on the Court is Christine Fizzano-Cannon who was elected in 2017. The 38th judge to serve on the Court is Ellen Ceisler who was elected in 2017.